It has been a while since I’ve had to sit down and pound some anatomy. Not since Biology 101 in college have I had to utilize my memorization skills for more than just digesting scripts. 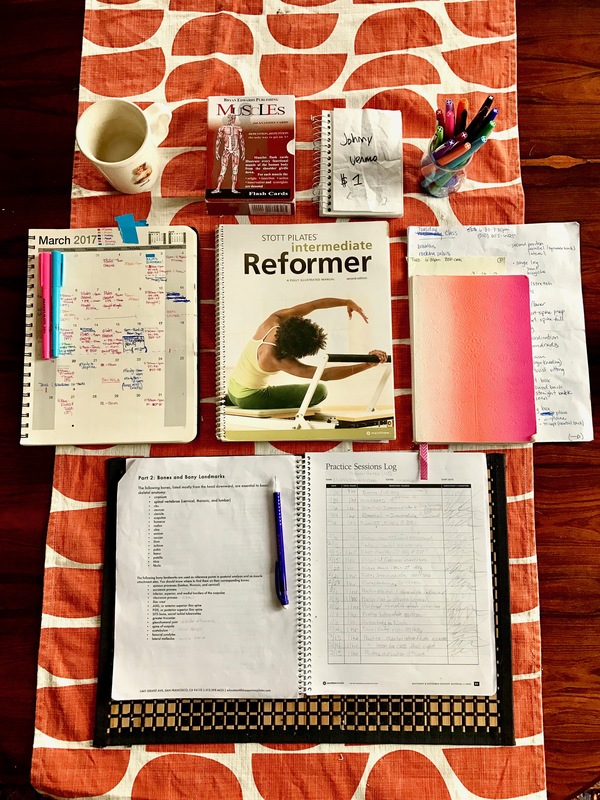 Now that my Reformer class is over – I’m finding my superior administrative skills are kicking in to high gear. I have a lot of hours to log before the certification is complete and that means staying on top of my schedule. On top of the logistics, I have a lot of anatomy to learn before the written exam. As a creative – anatomy is not something I’ve put a lot of focus on in the past. Having invested hours in studying, I can tell you that it’s mostly tedious but then there are ‘a-ha’ moments when all of a sudden you ‘get it’. In those moments I feel smart. I love acting because it makes me feel talented – but I have been enjoying the studying time for Pilates because I’m really digging the sensation of being in love with my mind’s capacity to learn new things. Wench mug with the lattes I told myself I would try to stop drinking. As many different colored pens as possible because – color is fun. And the $1 Venmo note from Johnny I won in a game of Uno – reminds me I’m a winner. 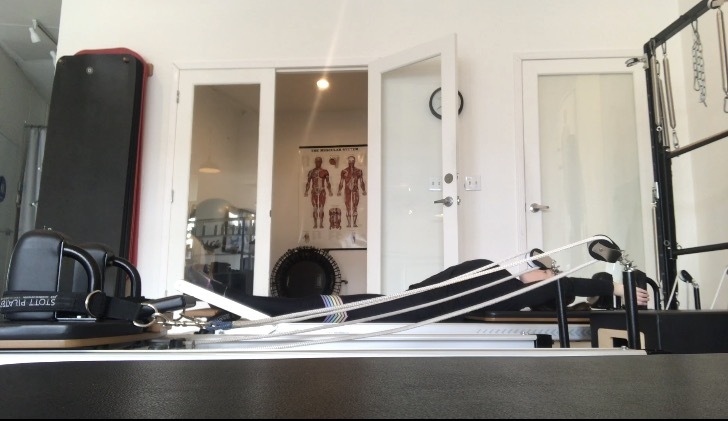 A lot of the exercises I’ve been focusing on this week are especially great in promoting spinal articulation. 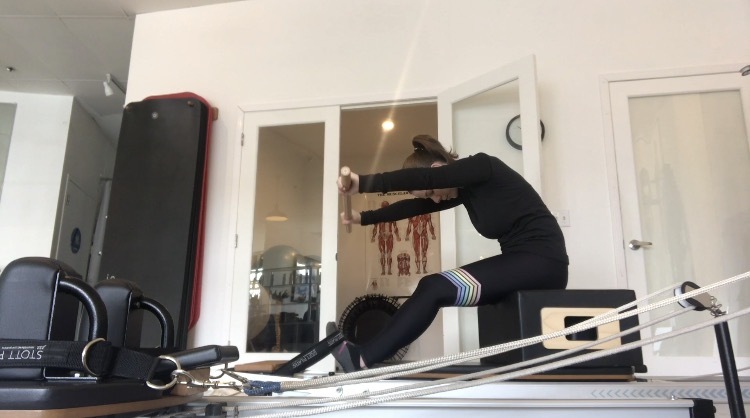 This exercise is called Tree and it’s an intermediate level exercise. 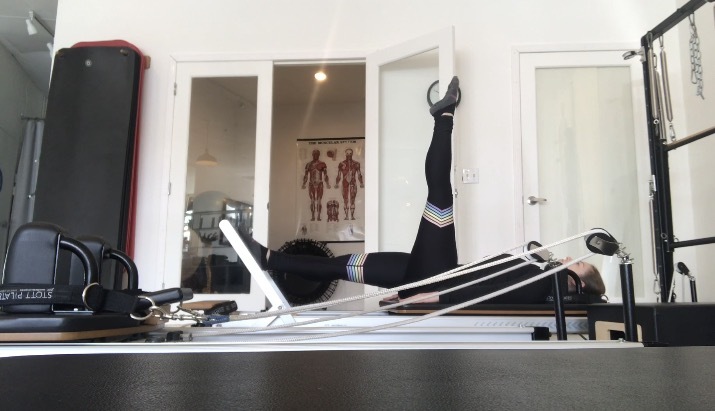 It’s important to maintain an engaged core to support your spine. 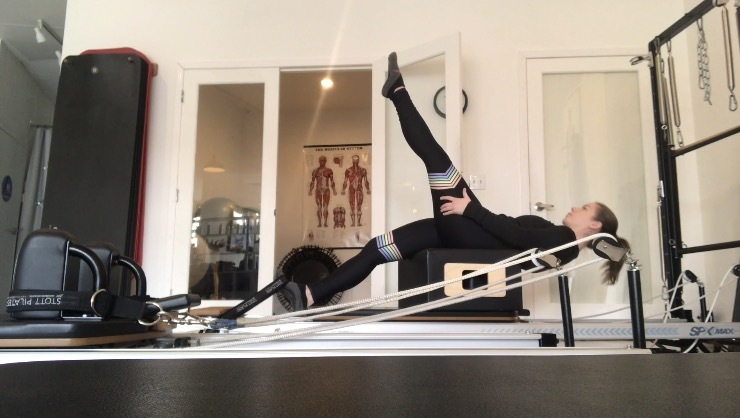 I love the leg stretches at the beginning of this exercise – it feels especially yummy as a hamstring stretch. Keeping one foot pulling taut on the strap, extend and flex your gesture leg three times. After the third time, keep your gesture leg extended and bring both hands to meet at your ankle. Begin to slowly walk your hands down your leg and you roll your spine down vertebrae by vertebrae. 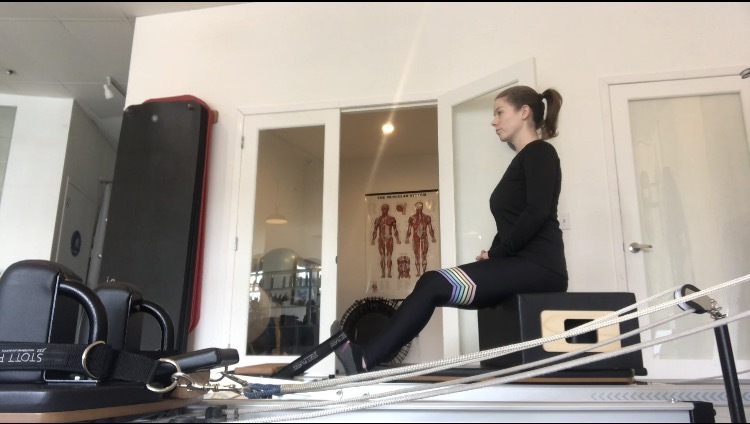 Once you feel your sacrum level on the short box, release your head to look back – keeping your hands on your leg for support. 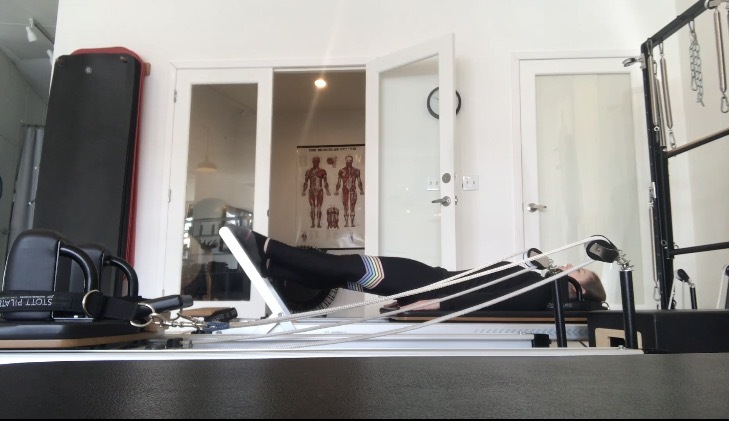 If you feel like you want more – extend your arms over head and grab on to the rails of your reformer to enter a full spinal extension. Take an inhale to tuck your chin and your draw your arms back up to the gesture leg. 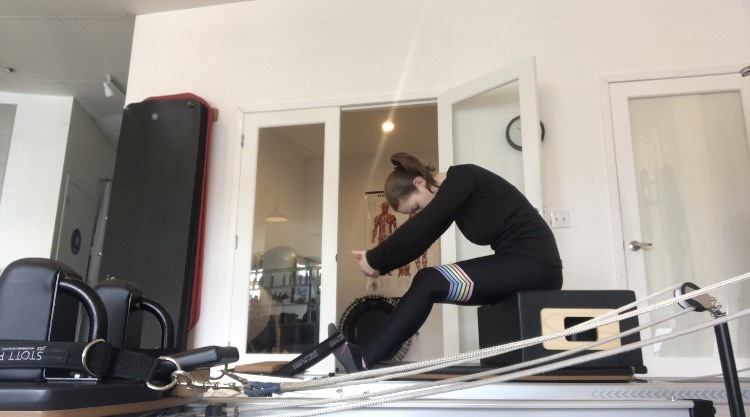 Begin to walk your hands back up that leg as your spine peels off the box. Once your spine is back in neutral, bend your knee and set your gesture leg down. This exercise is best done towards the end of a workout. 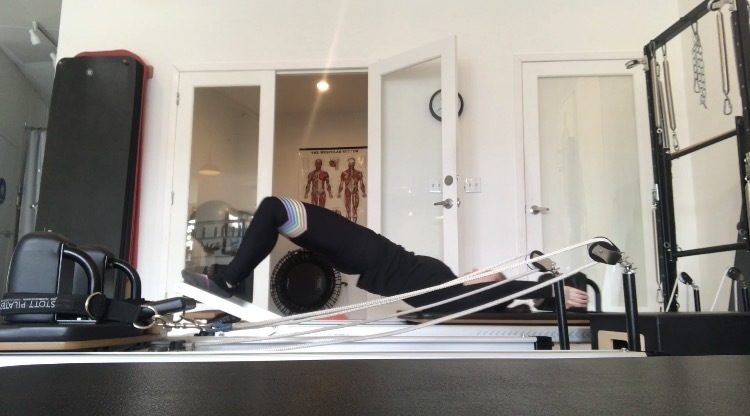 Making sure your hamstrings and abs are warm and firing before putting them to the test. 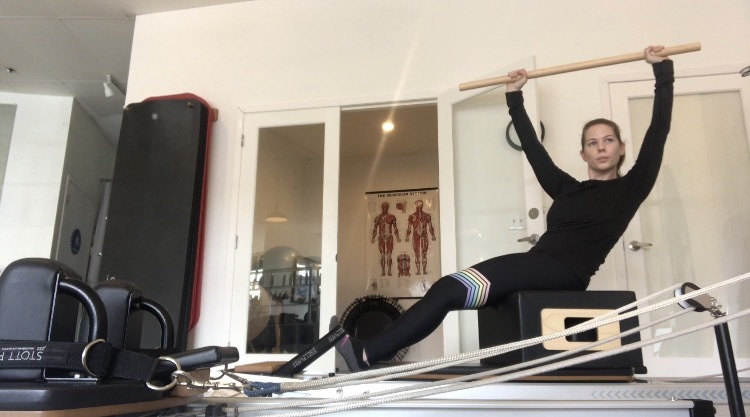 I know, there have been a TON of Pilates posts lately – but that’s what’s up in my life so that’s what’s up here. 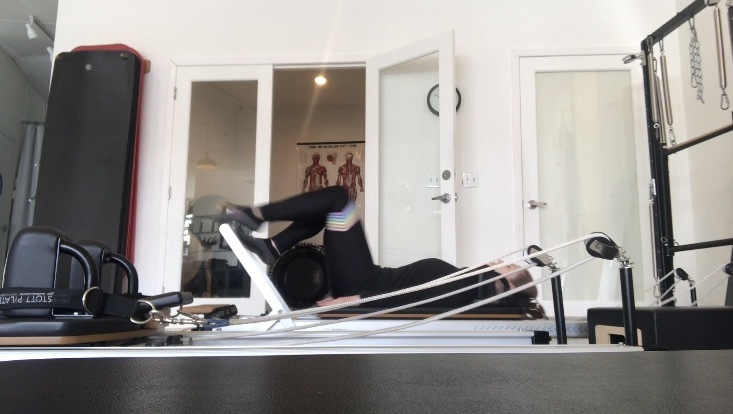 This week, I have been working on form for many of the intermediate reformer exercises. This exercise is called Semicircle and I hated it when I first tried it. 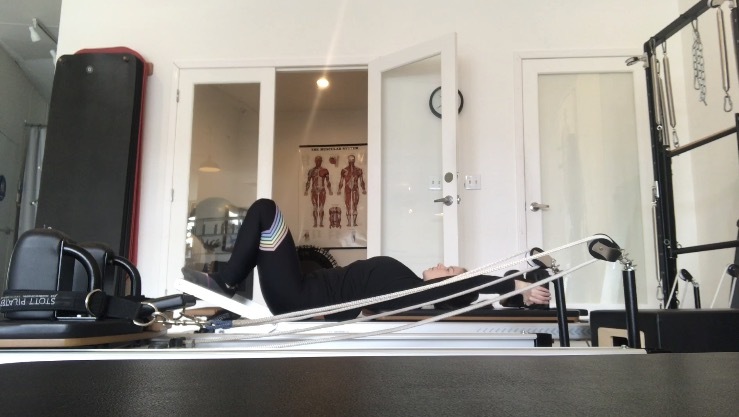 You have to roll your lower thoracic spine into extension and it’s a really odd sensation. People don’t normally bend back in half. 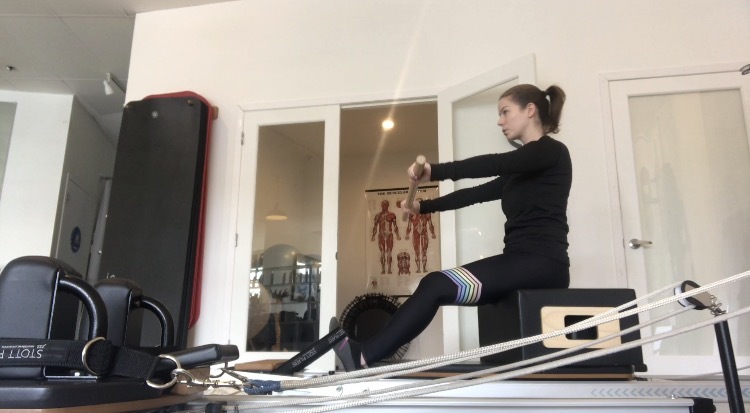 This week, I went slow and controlled through the movements and I found a really satisfying spine stretch that left me feeling looser and taller after my workout. Footbar at position 2, heels together, toes apart with toes on the footbar. Feet and legs laterally rotated. Roll your hips up to one long line with your body. Push through your feet to engage your quads and straightened out your legs. From here, start from the top of your spine and slowly roll down through the spine to drop into the well of the reformer. 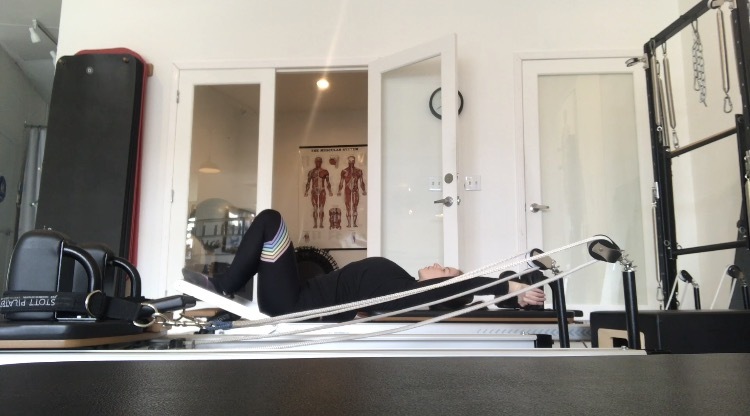 Maintaining that spinal extension, bend your knees to pull the carriage back in to the stopper. 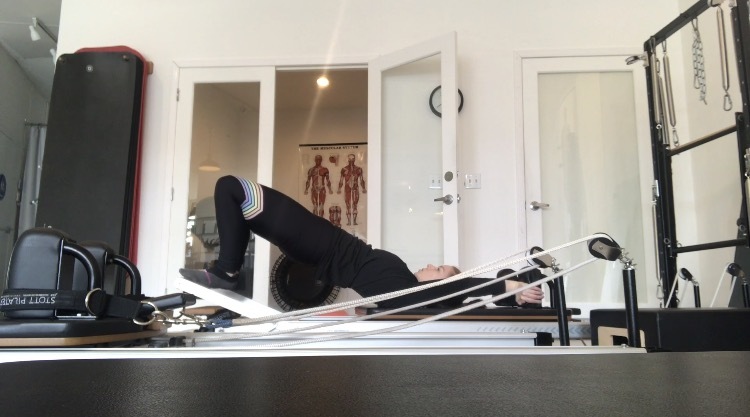 Tilt your pelvis to roll your hips up – articulating the spine from bottom to top. Come back to your starting position at one long line. Now, reverse the semicircle. 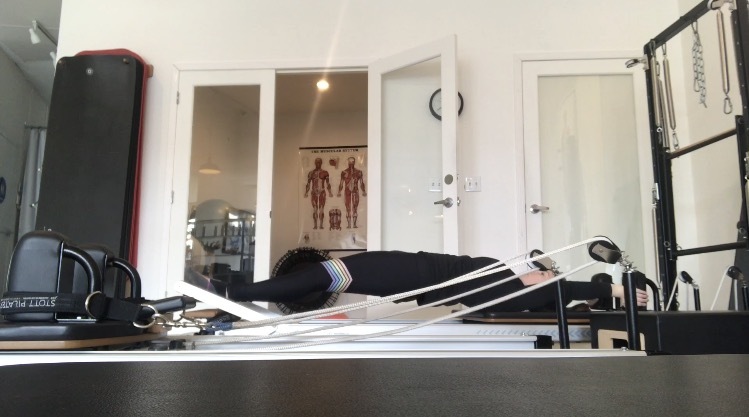 Starting from the top of your spine, begin to articulate back down into the well of the carriage. From here, extend your legs out to straight to push the carriage away. Lift your hips in line with your shoulders and knees. 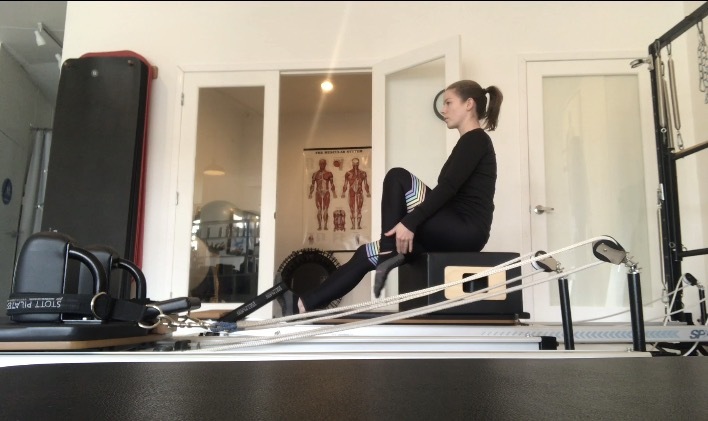 Bend your knees, keep your hips lifted, as you slowly return the carriage back to the stopper, maintaining that long diagonal line with your body. 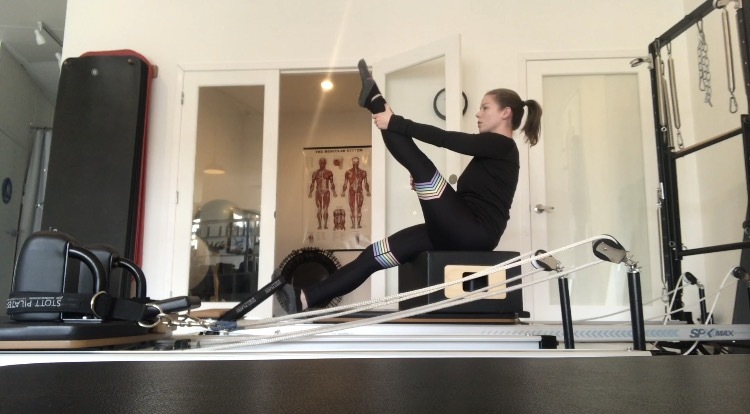 One of my favorites things about Pilates homework is getting to do some delicious stretches. The Developé is one of my favorite Pilates exercises. 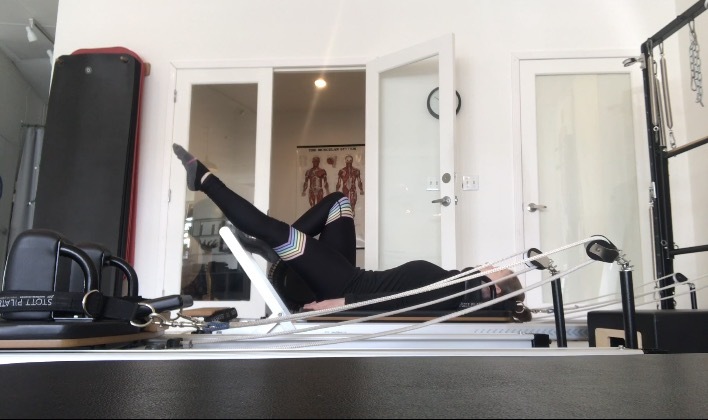 It’s an intermediate level exercise because of the coordination required and the core strength necessary to keep your spine supported with one moving leg. 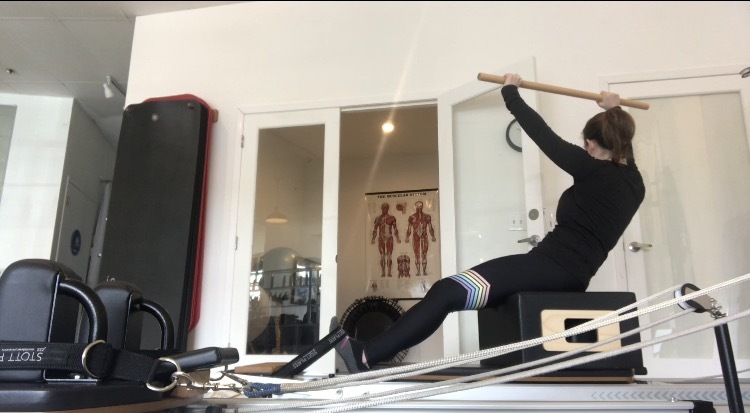 Once you start to use the correct muscles – at the right time – you find a flow that is so satisfying. It’s a full body stretch and roll that feels like a full body yawn. Start by placing your right toes on the footbar and your left leg extended out to a 45° angle – toes pointed. 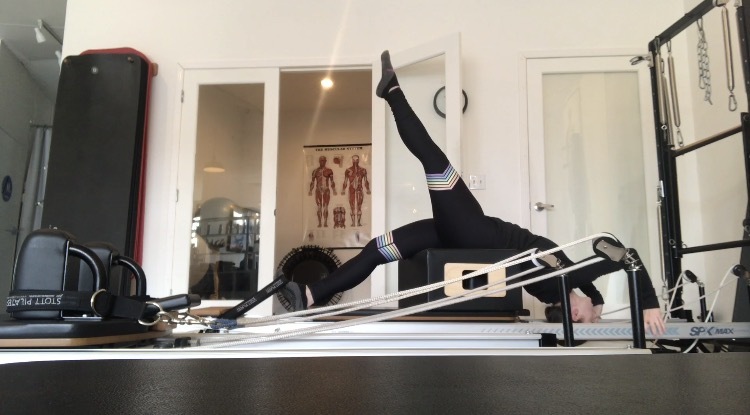 As you push your right leg out to straight, bend your left leg to move through bicycle before extending the left leg straight up to the ceiling. Straight leg to ceiling – point your toes! 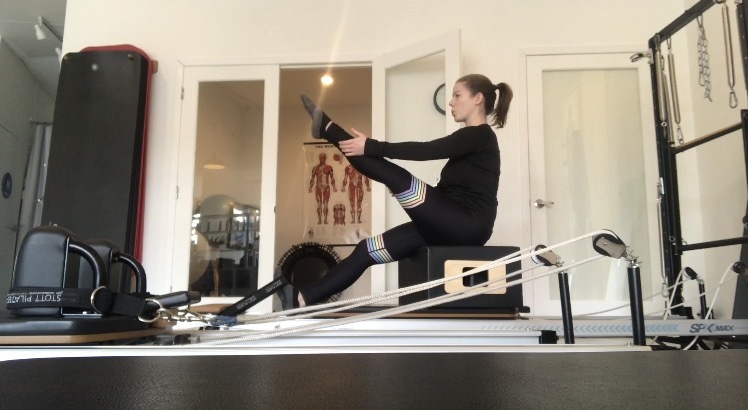 Keeping both legs straight, drop your left leg down to tap the foot bar before raising that leg back up to the ceiling. Stay here. Flex both feet – dropping your right heel under the footbar. Point both feet. Bend your right knee to control the return of the carriage as your left knee bends to move through bicycle before extending back out to your starting position at 45°. 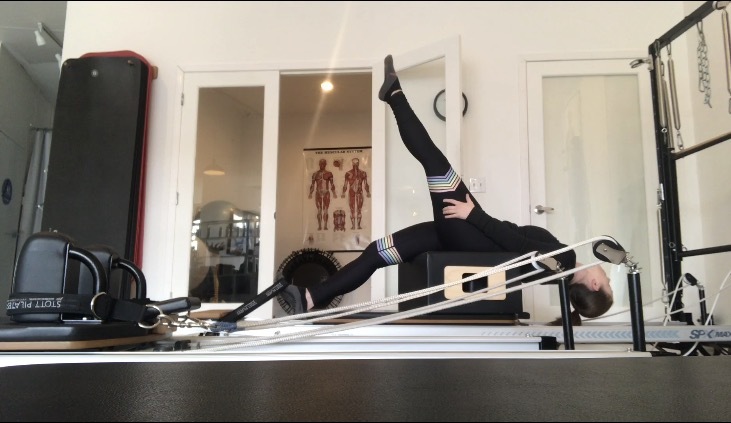 I’m teaching a free Community Pilates Reformer Class at Truve in Oakland, California every Monday morning from 9:30am-10:30am. Visit TruveFit.com to register. 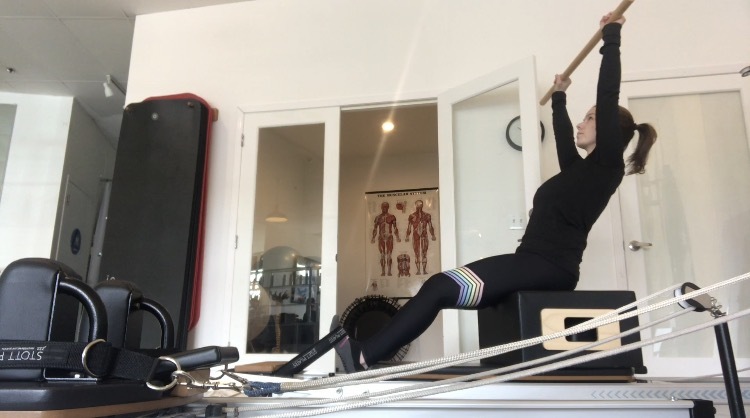 Pilates has been a part of my workout routine since 2009. A friend of mine invited me to take free classes at her studio, and I’ve never had more fun while working out. She was funny but firm. The workouts were hard but possible. They gave me greater body awareness and I felt it in my day-to-day life. 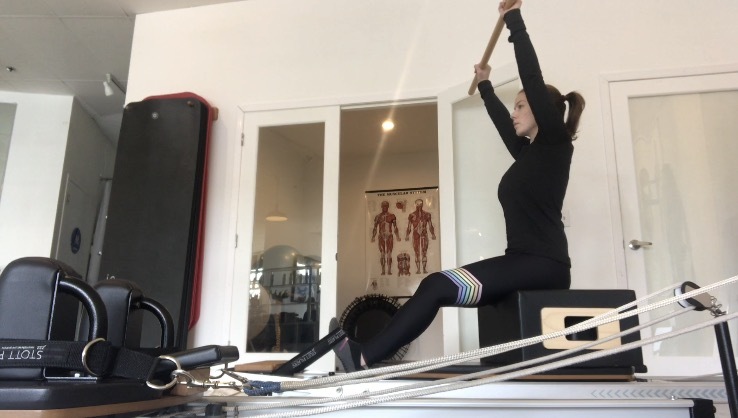 To this day, Pilates supplements my regular cardio workouts beautifully and I feel longer and leaner. I walk taller and move with more ease. 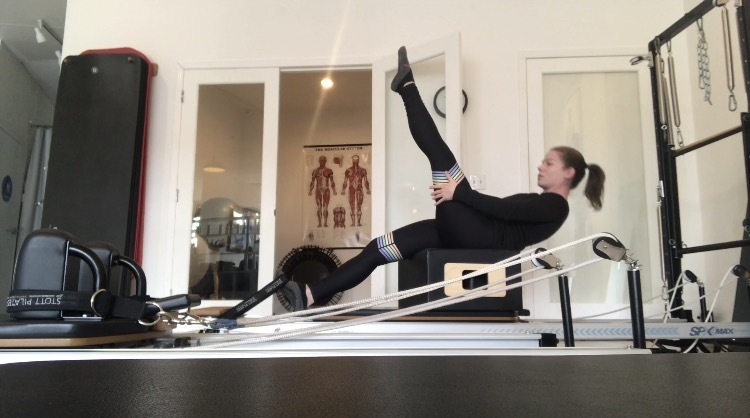 As I finish my certification, I’m going to begin teaching a free Community Pilates Reformer Basics class on Mondays from 9:30am-10:30am at Truve! 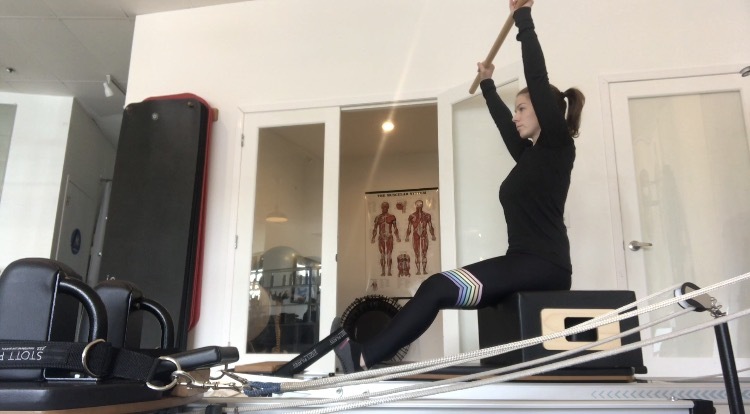 I’m excited to start programming lessons and building better strength, stabilization and mobility. Below are some examples of the kind of exercises we’ll be doing. Come take a class – it’s free! Truve offers a ton of amazing classes! 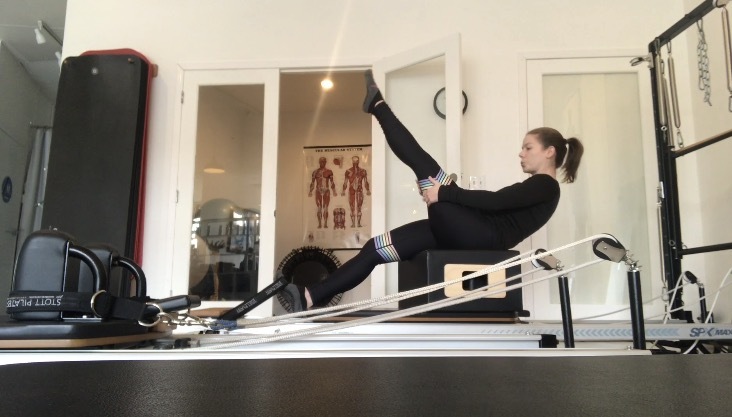 Check out their class schedule and click the ‘Community Pilates Reformer Basics’ box to sign up for my free class on Mondays at 9:30am. Hope to see you there! Twenty seventeen is the year of the body! Ever since taking off with Ben and the band for the Smoke + Mirrors Tour, I have been in the habit of working out on a regular basis. The guys brought their trainer on tour and working out became an obvious way to kill the time. We got our asses kicked on a regular basis during these circuit training workouts. I continue circuit training in Oakland, but I’ve found that my body needs something to stretch and realign itself in between. 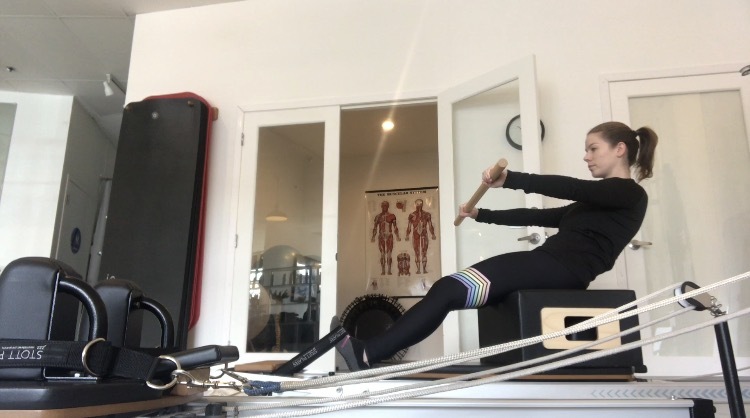 Pilates has become the perfect supplement to my regular workout. Currently in training, it’s been amazing to see the difference in the way my body feels after a Pilates workout. 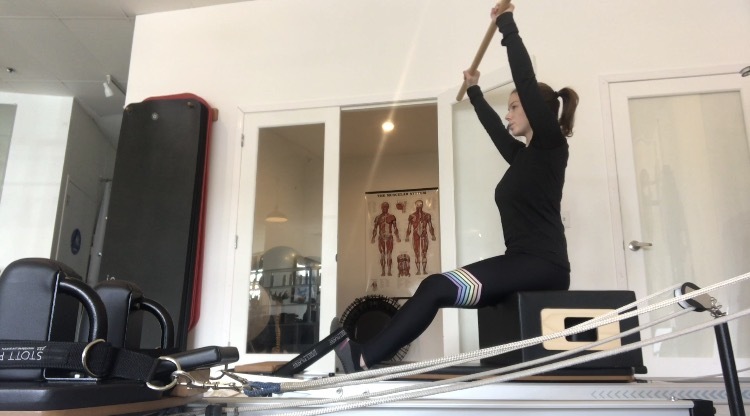 There’s so much concentration on stability and strength – mainly a stable shoulder girdle, abdomen, pelvis, and spine. 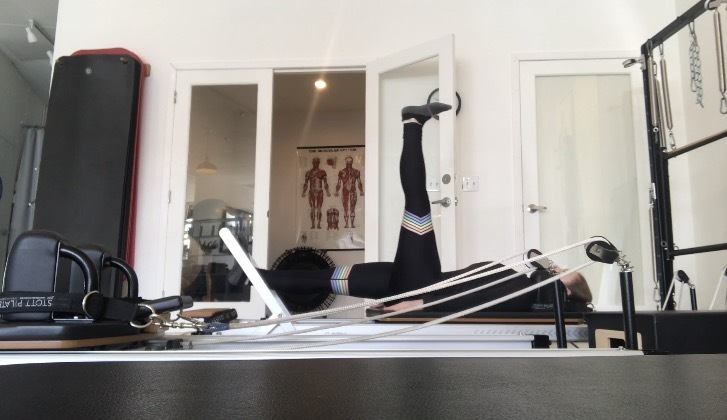 While I study for my certification, I am putting in practice hours to help me go over all the reformer exercises. These are some time-lapse videos of my workout today. My muscles and joints feel strong and stable and I can feel it as I go about the rest of my day. I’m so excited to start taking on clients! Shout out to my personal trainer, Alison Rossler Campbell, at TruveFit for the beautiful space – how beautiful is this gym?! 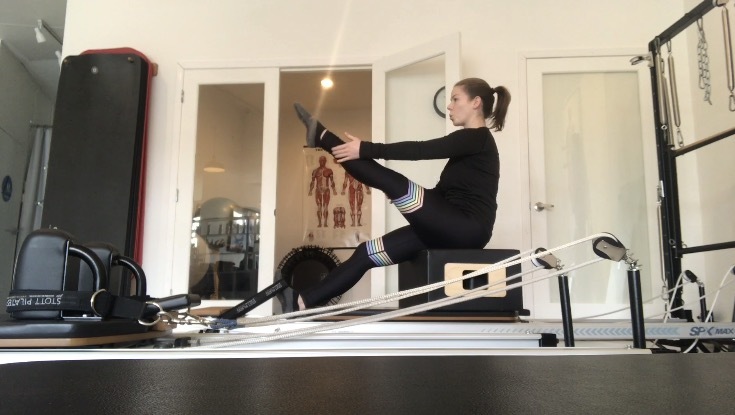 My favorite Bay Area pilates spot is Blue Sparrow Pilates – two locations San Fran & Oakland.